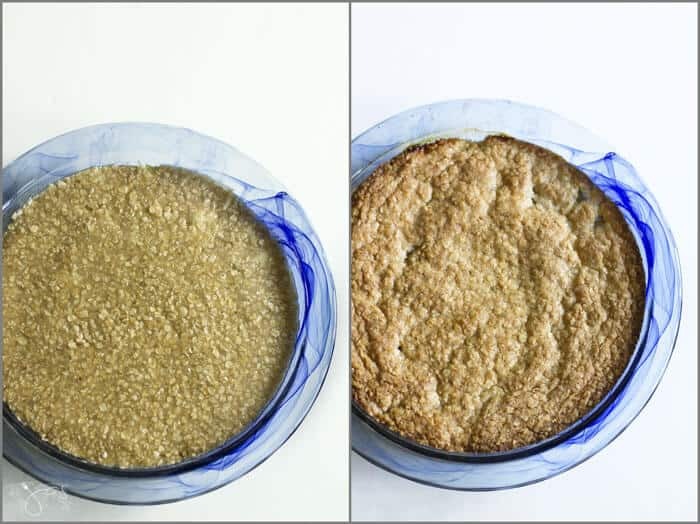 This Swedish Apple and Oatmeal Pie recipe is in partnership with Rodelle, Dreamfarm, Casabella, Flahavan’s Irish Oatmeal, Pyrex, Chicago Cutlery, Rainier Fruit, and Veggie Wash. They provided giveaway prizes for #AppleWeek free of charge and provided the bloggers with samples and product to use for #AppleWeek. All opinions are my own. 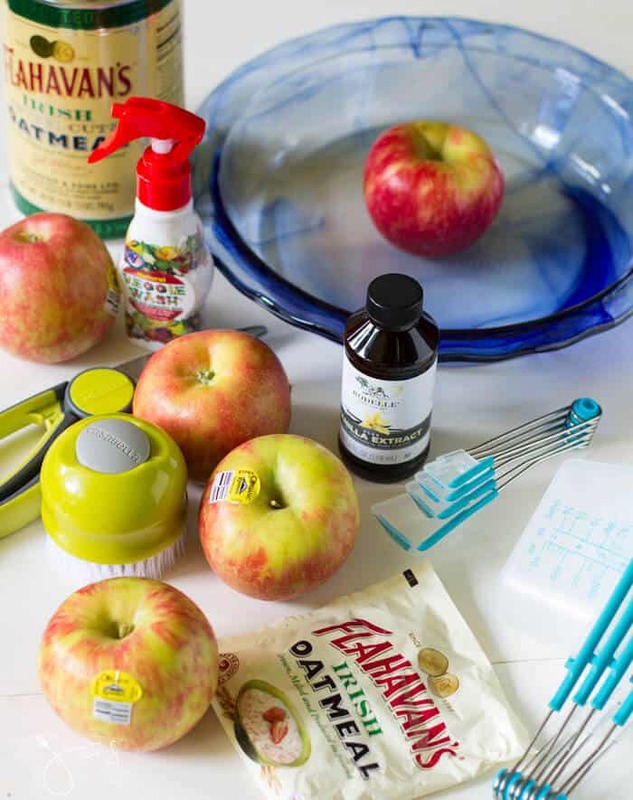 Looking for a new apple pie recipe? This Swedish apple oatmeal pie is anything but traditional. The crust is on the top, the main spice is cardamom instead of cinnamon, but it’s mellow and comforting. Topped with the vanilla sauce it’s sure to be your family’s new favorite. At my age, recollecting childhood memories happens almost daily. And there’s nothing that triggers them better than food. In fact, I put this pie in the oven and it worked its magic. With the first whiff, my mind pictured the little maple tree we had in front of our house, its golden leaves glowing in the autumn sun. Soon, the aroma spread through the entire house giving me that warm and fuzzy feeling I had when I used to cozy up on mom’s lap with my favorite blanket. Pure comfort. Suddenly, I could not wait to take this pie out of the oven. With a blanket on my lap and pie in my hand, I sat in front of the window looking out to the backyard at our massive maple tree. Although the temperature was reaching 83 degrees, I did not care. Watching the first leaves take off and slowly float in the air made me feel like a little girl again, happy and safe. 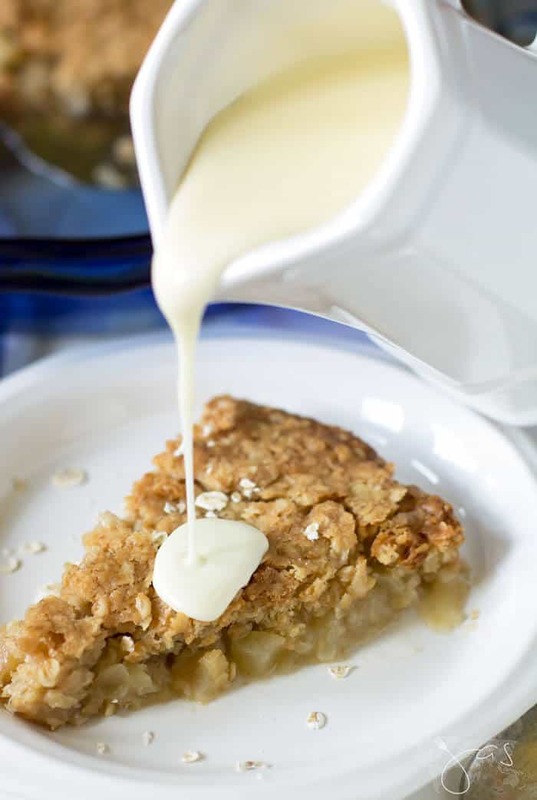 HOW IS SWEDISH APPLE PIE DIFFERENT? 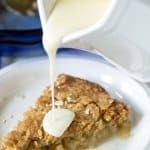 This Swedish apple pie doesn’t use traditional pie crust and the oatmeal crust is on the top, but it has the same magic. Moreover, the filling is spiced with cardamom, as Scandinavians love cardamom and vanilla sauce with their äppelpaj. So go ahead, first grab a spoon and then find a nearby window where you can watch fall take over your yard. Finally, forget all worries. I promise you’ll be more content with each bite you take. P.S. Don’t forget to scroll down for more yummy apple recipes and also to come back tomorrow for new recipes! Preheat oven to 350 degrees Fahrenheit. Grease a 9″ inch pie. 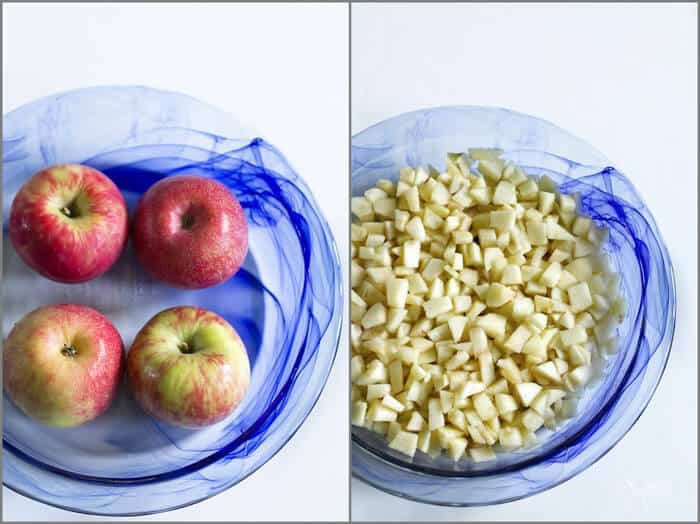 Mix together the apple chunks, cardamom, and sugar in a large mixing bowl. In another bowl, mix together the melted butter, sugar, maple syrup, and vanilla. Add the oats, flour, baking powder, and salt. Stir until just combined. Spread the apples evenly on the bottom of the prepared pan. Spread the topping over the apples. Bake for 45 minutes, or until the topping is firm and apples are bubbly. 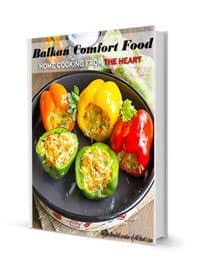 Place all ingredients in a small saucepan and bring to a boil over medium heat, stirring constantly. Reduce the heat to medium-low and continue to cook, stirring occasionally, until the mixture thickens, about 15 minutes. The sauce will thicken as it cools (Best when used cold. It was still warm when I took the photos so it wasn’t as thick). Spoon the sauce over apple pie and even cakes, waffles, pancake, and bread pudding. Keep the sauce in an air-tight container in the fridge for up to a week. This pie is exceptional without cinnamon, but feel free to add a teaspoon or two to the filling. Serve the pie warm with vanilla ice cream instead of the sauce, but I highly recommend the sauce. For the gluten-free version, substitute 1/2 cup flour with a 3/4 cup oat flour. I love the citrus smell of the Veggie Wash which safely removes wax, soil, and agricultural chemicals found on standard and organic produce. I even used it to wash my organic Rainier apples, while scrubbing them with Casabella 2 ‘N 1 veggie brush. Flahavan’s oatmeal flakes are finer, which is faster to cook. I’m all about cooking fast. The measuring cups and spoons from Dreamfarm are super fun! The handles squeeze together to scrape off excess ingredients giving a level and accurate measure. In case you didn’t know, I’m obsessed with kitchen gadgets. Aren’t you too? This gorgeous watercolor pie dish from Pyrex looks even prettier in person. Perfect to serve this Swedish pie in since, although delicious, the pie looks kind of homely. This Swedish apple oatmeal pie is anything but traditional, but it's mellow and comforting. Topped with a homemade creamy vanilla sauce it's sure to be your family's new favorite. Preheat oven to 350 degrees Fahrenheit. Grease a 9" inch pie. Reduce the heat to medium-low and continue to cook, stirring occasionally, until the mixture thickens, about 15 minutes. The sauce will thicken as it cools (Best when used cold. It was still warm when I took the photos so it wasn't as thick). Spoon the sauce over apple pie and even cakes, waffles, pancakes, and bread pudding. Keep the sauce in an air-tight container in the fridge for up to a week. See this post featured on Inspiration for Moms, Across The Boulevard, and Artsy Fartsy Mama. This looks SO delicious, Jas. Thanks for sharing it with #AppleWeek. I can’t wait to try it. Thank you, Camilla! It tastes much better than it looks, ha! I’m laughing here because as I read your title….Swedish Apple Oatmeal Pie….my childish mind finished…..who’s not ready holler I. Then I read your first sentence and it talks of childhood memories. Still shaking my head LOL. Nothing childish about this pie though, it sounds amazing Jas. Wow, Wendy! It’s true, food triggers childhood memories 😀 Thanks for stopping in! Yum Yum! This looks absolutely fabulous! What a great fall treat and a perfect way to kick off AppleWeek! Yummy – this sounds delicious! I always love all the memories you have tied to your recipes. Aw, thank you, Val! That means a lot! That vanilla sauce sounds incredible, I’d be pouring it over everything! I don’t know if I can give up my cinnamon, but I’ll give it a shot for this lovely dessert. You can totally add cinnamon, Lauren! I poured my leftover vanilla sauce over bread pudding but it’s great for just about anything, lol. So glad this is right up your alley, Leah! I hope you find more apple recipes from our #appleweek you like 😀 Thanks for stopping by! 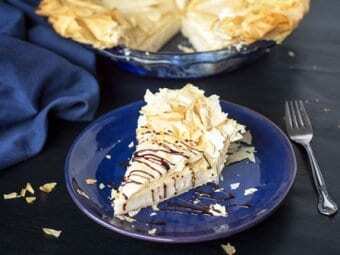 This pie simply looks amazing! 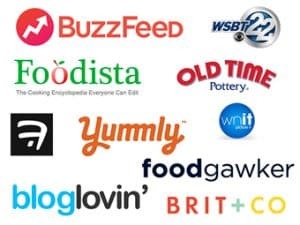 Thanks for sharing it on the All Things Apple Celebrate 365 Blog Party! Jas, this was sooooo yummy. And I’m proud to write…I ate it for breakfast too. My defense is that it has oats! :). Awesome recipe! Jaw-drop! This looks absolutely delicious. Can’t wait to make it for our kids. This recipe sounds wonderful! Pinned for later! Thank you so much, Jess, and thanks for stopping in! This sounds and looks delicious! Thanks for sharing at the What’s for Dinner party! Looking at the picture and reading the ingredients I think I smell this. LOL It got chilly down here in Florida and I have been in to Oatmeal, I must share with my friends. Apple Pie definitely takes me back to a time when life was simpler. Blissful memories indeed. I have no doubt that this crust on the top pie will take me back and satisfy my sweet tooth. Thank you for sharing with us this week at Celebrate Your Story and we hope you will join us again next week. Thanks, Sandra. Wasn’t life much better when it was simpler? Have a great weekend! It’s perfect with morning coffee, Donna! This looks and sounds so delicious! I love Swedish vanilla sauce. It definitely goes perfect with apple desserts! My step mom is from Sweden and she always has vanilla sauce with desserts. I feel like the vanilla sauce is always in place, instead, of ice cream. That’s so neat, Natalie! I bet she has the real yummy Swedish vanilla sauce recipe. Lucky you! Everything about this recipe says cozy! Pinning to try later – thanks so much for sharing with Party in Your PJs! My husband has Swedish heritage. This looks and sounds delicious! I am much more a vanilla person than chocolate. Thanks for sharing with SYC. I WANT this. Printed on the spot! I’m thinking it would make a great Sunday morning breakfast. 🙂 Found you at both #FridayFrivolity and the Blogger’s Pit Stop! I love to read about new versions of apple pie or any apple dessert. Traditional is something you make all of the time and never change the ingredients. We need to explore like you have adding oats and cardamom – how different. I love that spice too – wish I could taste your pie. Then the vanilla sauce to finish – that’s quite a pie! Thanks for sharing with Fiesta Friday. Hi, Judith! This one definitely was a pleasant surprise. I was a bit worried because it looks so plain, but I love the mild flavor. Thanks for stopping in! I like this idea, a combination of a crisp and a pie. And cinnamon is not a favorite so it is perfect! Thank you for bringing it to FF. Haha, let the kid bake – better safe than sorry 😉 Thanks for stopping in, Michelle! Jas I have a great big jar of oatmeal that my kids won’t eat. This is going to be the perfect solution. Hide it in the pie! 😉 Thank you! Is the 1.5 tablespoons of vanilla in the oatmeal topping a misprint? We thought it may be…so we tried it with 1.5 tsp, and it came out fine.